Readers who have followed me for a while will know that each year, I try to do something special to some of the pre-ordered copies of my novels. This year I had a really ambitious idea and Scholastic was lovely enough to help me take this concept and run with it. 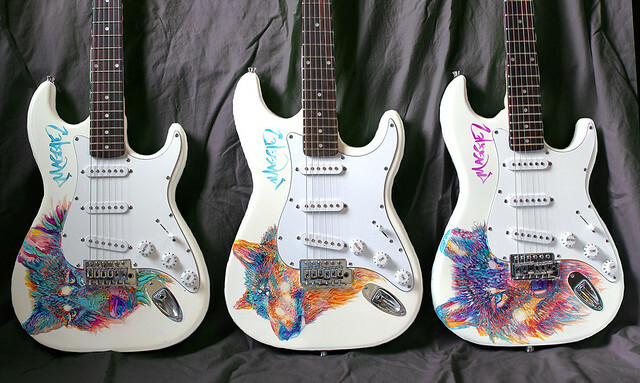 Scholastic was also kind enough to ship three white electric guitars to my house, and I did things to them too. 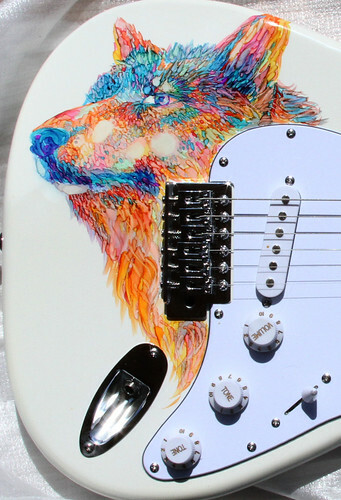 The guitars will be raffled off on the first and last event of the Sinner tour. One of them will be given away during a Scholastic/ This Is Teen online thingy. I’ll be sure to pass along info when this happens. The book wrappers require rather less luck to acquire. 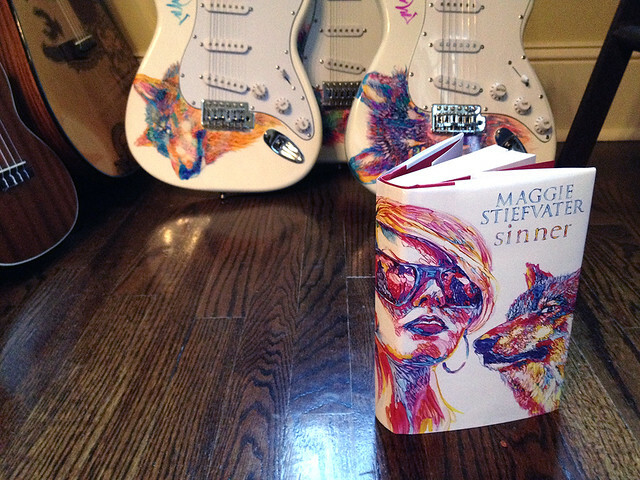 Every copy of Sinner pre-ordered from Fountain Bookstore will be signed and come with one of the them. 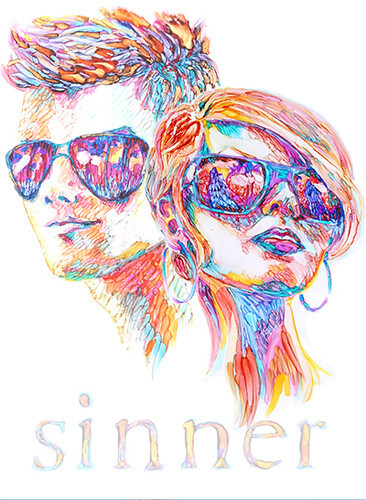 (Also, FB would like to remind everyone that if you pre-order Sinner and Blue Lily, Lily Blue at the same time, both books will ship in October when BLLB comes out — if you want two shipments, you will have to pay two shipping costs). 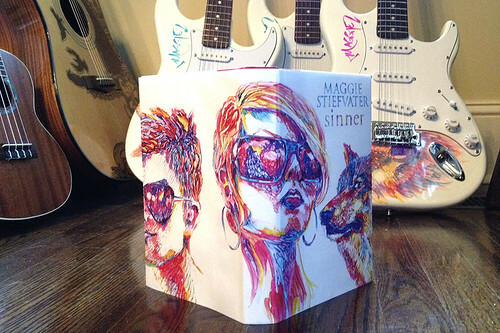 Also, the book wrappers will be available at every single stop on the Sinner tour. I’m also pairing up with Seven Stories Bookshop in the UK again this year, and their pre-ordered copies of Sinner will include this signed custom bookplate. Now, on to the tour! 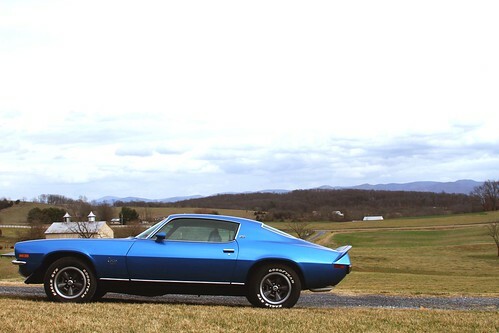 Again, because Scholastic loves me, they are allowing me to do a coast-to-coast driving tour for Sinner in Loki, my Camaro. I did this for the Forever tour back in 2011, and I think it’s sort of nice and circular to head out again in the car for this return to Cole and Isabel. Also, it means I’ll smell like gasoline and exhaust at every event. Here is the schedule. I’ve done a bit of math and it seems to be 3,964 miles one way. Full details here on the website. Note: I will also be at BookCon/ BEA in NYC, IRA, ALA, BYU Symposium for Young Readers (Provo), and Decatur Book Festival. Note, part two: I will not be touring overseas this year because I am going to need every second of spare time to finish the Raven Cycle on time (I trust you’d rather have that book than my body). ← The Cover & Title of Raven Boys III is . . .